Make a soaker with whole wheat flour and spelt berries. Let it sit at room temp, covered. A day later, mix yeast with warm water and honey. After 5 minutes, add the foaming yeast to the soaker, along with some salt and enough whole wheat flour to make a sticky dough. Knead for 5 minutes, form a ball and transfer to a bowl coated with good EVOO. Let rise until doubled. Pour out dough and slice off chunks that will form 3 inch diameter balls. Wrap balls in plastic wrap and refrigerate or freeze. After a day of chilling, preheat oven to 500 F, with a heavy cast iron pan on the middle rack. Pour 1/4 cup of poppy seeds on a work surface. Take the dough ball from the fridge, unwrap it, and flatten it on top of the poppy seed mound. Flip the dough over and smash it into the seeds again, sweeping the seeds into a pile as needed. 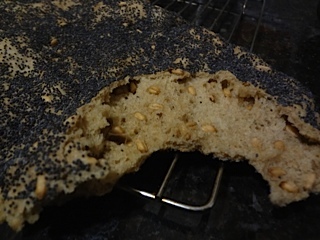 Continue until the dough disc is black on both sides with poppy seeds. Slide it onto the preheated pan and bake until puffy, about 5-6 minutes.